At a news conference Wednesday afternoon, Pennsylvania Republican Party Chairman Val DiGiorgio announced that the state Republican Party has sent a three question survey to all 18 Democrats running for Congress in Pennsylvania to ask them whether or not they will support Nancy Pelosi, if they support the agenda of the Democratic Socialists of America, and/or if they support Congresswoman Maxine Waters’ call to publicly bully Trump administration officials. “Pennsylvania Democratic Congressional candidates have been silent on these matters important to voters in making their decision about who to vote for for Congress,” said Chairman DiGiorgio. The surveys were mailed Wednesday morning. In addition to directly mailing the surveys, postcard-sized copies of the survey will be distributed to county Republican committees to be distributed to Democratic congressional candidates on a grassroots basis. “The more that Pennsylvania Democrats remain silent about a radical socialist agenda that disrespects taxpayer dollars and incites violence, the more they are complicit in it,” Chairman DiGiorgio added. 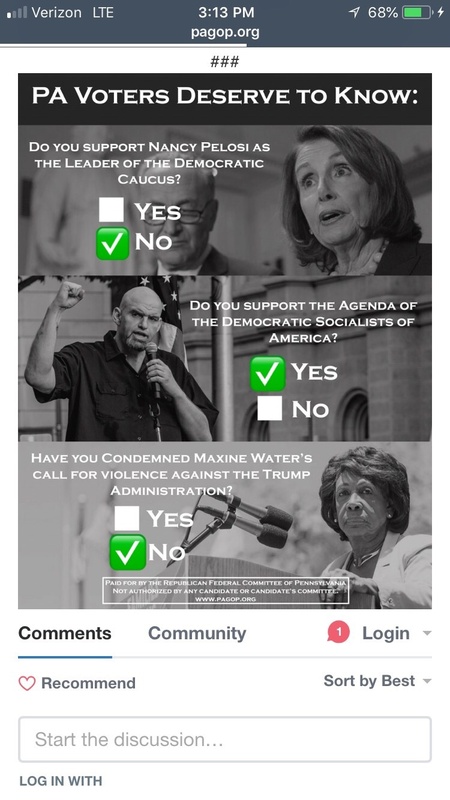 Socialists of America, and/or if they support Congresswoman Maxine Waters’ call to publicly bully Trump administration officials.